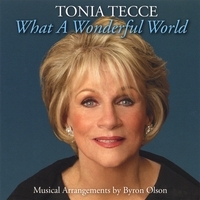 What a Wonderful World is not the kind of album you’d expect from an unsigned artist. Usually a record such as this – immaculately produced, lushly arranged, backed by real orchestras including the Philly Pops, the New Jersey Pops, and the Newark Symphony – stems from an ambitious dream that only major labels can fulfill. I won’t even attempt to guess how expensive this CD was to create. But, when you’re handling a class talent with a stunningly beautiful operatic voice like Tonia Tecce, there shouldn’t be any holding back. That isn’t hyperbole, either; this is a woman who has performed at Carnegie Hall. The orchestral sweep of “It Could Happen to You” and “Dream Medley” takes you into another realm, a world of beauty and wonder; Tecce’s uplifting soprano becomes one with the instruments, as if she is carried by their winds. At times, her singing reminds me that of Julie Andrews but with a more operatic flair. On “O Mio Babbino Caro,” Tecce’s voice is so haunting that I feel like I’m listening to vinyl from a half-century ago; you can almost imagine the snaps and pops in the tune. It’s a tie for who has the most powerful instrument on What a Wonderful World: Either Tecce and her vocals or the tools of the symphonies who are supporting her here.